The only thing scarier than falling in love is the idea of having to spend your entire life alone. We all know that it won't come to that. We know that our person is out there somewhere, we've just got to wade through the morass of terrible partners to find them. However, sometimes it's not just other people standing between us and a lasting love that will stand the test of time — sometimes it's ourselves. And as this free personality test will reveal, your behaviors might be responsible for your loneliness. Nobody out there is perfect, and sometimes our flaws, foibles, and fears can stand in our own way, particularly when it comes to finding love. While we all know that, what we don't always know is what exactly is going on with us that's keeping us from a relationship. It's difficult to be totally objective about yourself, isn't it? Especially when you don't quite believe what a personality quiz or personality test is telling you. But that's where this particular personality test comes into play. This optical illusion designed to help you find out in a matter of seconds what's keeping you from a relationship. All you have to do is look at the image below, pay close attention to what you see first, and then scroll down to see how what you saw reveals why you're still on your own. No matter what your results are, take heart! You're going to make it out the other side just fine — the key is knowing yourself. Now let's do this! If you saw the moon first, you're still alone because tearing down your walls doesn't come easily for you. You crave intimacy, you believe it is an experience that will only make you a better person, but when it comes to lowering your defenses and letting other people in, you just aren't that keen. If you don't conquer this fear you'll never come close to getting what you want, plain and simple. 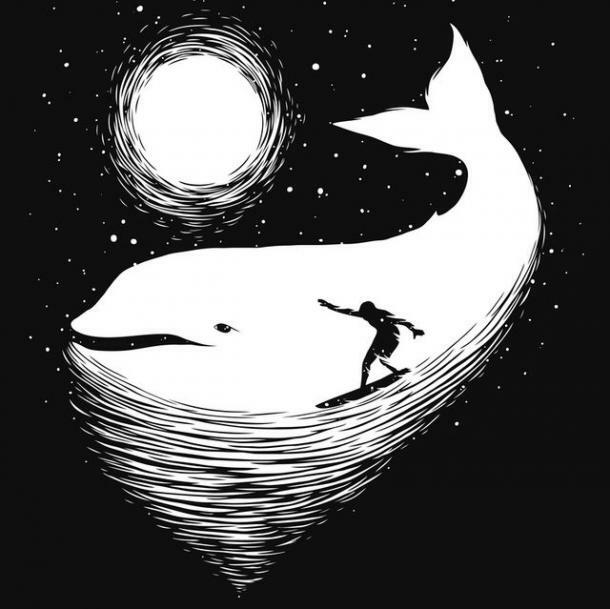 If you saw the whale first, you're still alone because you're always looking out for number one. It's not that you're a selfish person, it's just that you have a lot planned for yourself, and you know that love means sometimes putting someone else's needs above your own. You just aren't there yet, but at least you know it. If you saw the surfer first, you're still alone because you're afraid of being tied down. To you, love isn't something freeing, it's something scary and daunting because it means giving up a part of who you are. When love starts to feel real, you've got one foot out the door. Try sticking around and you just might find that lasting love is the biggest adventure of them all.